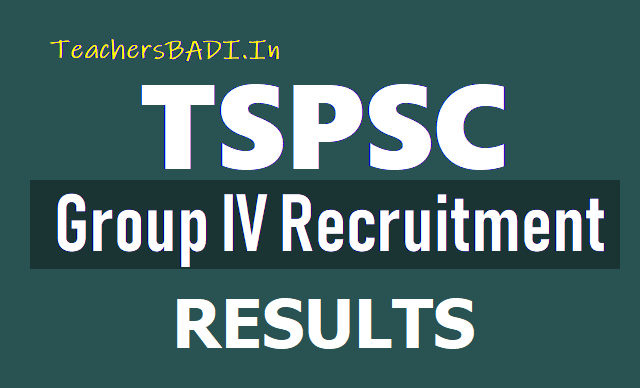 TSPSC Group IV Results 2018 declared on March 19, 2019. Candidates can obtain the result from the TSPSC's official website. Telangana State Public Service Commission (TSPSC) has released the merit list of Group IV services on its official website on March 19, 2019. The candidates who have appeared for the Group IV services recruitment process can visit the official website of TSPSC- tspsc.gov.in- to check and download their Group 4 result. The TSPSC Group IV services recruitment exam was conducted on October 7, 2018, at various centers across the state. The candidates can check their result from the direct link provided below. TSPSC conducted this recruitment drive to fill up 1,867 vacancies. The candidates who have qualified the exam will be posted in various departments such as Bill Collector, Revenue Department, Home Department, Junior Assistant, etc. The Telangana Public Service Commission (TSPSC) has announced the results of Group 4 examination. The merit list of the candidates is available at the official website of the board -- tspsc.gov.in. A total of 2,72,132 members cleared the exam of which 33,132 qualified for junior assistant in Telangana Road Transport Corporation (TSPSC), 69,378 for bill collectors in GHMC and 19,545 in Beverages corporation. Group 4 exam was conducted in October last year to fill up 595 vacant posts. Candidates qualified in the exam will be called for certificate verification. Telangana State Public Service Commission, TSPSC has released the TSPSC Group 4 merit list 2018 along with the merit list for 3 other notifications. The merit list for TSPSC Group 4, junior assistants in Telangana State Road Transport Corporation, Bill Collectors In Greater Hyderabad Municipal Corporation and various posts in Telangana State Beverages Corporation Limited are now available on tspsc.gov.in. As per the official notification, 2, 72, 132 candidates have been included in the TSPSC Group IV Merit List 2018. 33, 132 Junior Assistants in Telangana State Road Transport Corporation; 69, 378 Bill Collectors in Greater Hyderabad Municipal Corporation and 19, 545 various posts in Telangana State Beverages Corporation Limited have been released. TSPSC Group 4 Merit List and Other Results: Candidates who had appeared for the written examination may check the merit list on the official website tspsc.gov.in. Please be informed that the official website is taking some time. The Merit Lists are also provided here for convenience. List is PDF document is available in order of merit. Candidates may search for their regsitration number to check their rank as well as their score out of the total. Candidates are advised to check their result on a desktop as it would be easier to browse through the list. In the recruitment exam, total 33,132 have been selected for the Junior Assistants posts in TSPSC. The TSPSC competitive examination was held on October 7 in two shifts to fill in total 1,595 vacancies of Group-IV services.